We do centers and use our brand new laptops. One of our favorite websites on the computer is Construct a Word. We also write our spelling words with shaving cream during centers. On Fridays we can earn free time by following the rules all week long. We also get prizes.We love to read during reading workshop because we get to read the books that we like. During morning meeting we sing songs like Bananaphone and On Top of Spaghetti. We love to sing. We also have made cool stuff like our“Official Second Grader” stars. Help us find out about your class! 1) What is your favorite thing to do at school? 2) Would you like to do any of the stuff that we do? 3) When did you start school? *Social Studies because we are working in groups to make maps of our classroom. We like to sing songs, but we don't sing in our class unless it's Music class. That would be really fun to do--maybe we can start to do that like you do! We noticed that you like some other blogs. 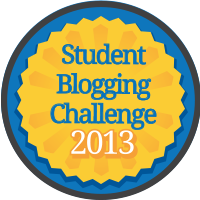 Can you tell us about some of the classroom blogs you visit? We have been to Mrs. Watson's Class blog. They are our blogging buddy. Their class is from Canada. You should go visit them. We watched a video of them reading and saw a rug with a map of Canada on it. The United States was brown and boring. Check it out! Have you found any blogging buddies yet?